These cubes are manufactured from granulated bark and inoculated with root promoting microbes. These beneficial organisms will deliver a positive environment for rapid root development and explosive growth. Root Riot! is the new organic propagation medium. Made from composted organic materials, these new cubes have a great spongy texture which retains the perfect air / water ratio for healthy rapid root growth. 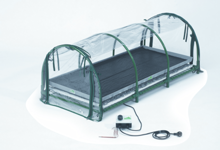 Specially inoculated with micro nutrients to nourish the young plants, and also beneficial rooting fungi to aid root development. 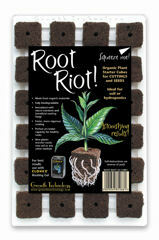 Suitable for both cuttings and seeds, Root Riot consistently out performs alternative media. Clonex and Root Riot are the perfect partners for propagation success.